Seafood lunch in the village famous for Lobster! On this walking tour along parts of the Portuguese Way (Camino de Santiago) in Portugal/south of Galicia/the coast you will visit a wide variety of sights including in Valença do Minho, Tui, O Rosal, Santa Tecla, A Guarda and Baiona. Your Food, Wine & Expert Camino Guide will meet you at the starting point. An excellent option for those who would like an active day with plenty of short walks along with a good lunch and learning about the local food and wines of the region. VALENÇA DO MIÑO : You will be dropped off next to the Camino (the Portuguese Way) where you will commence your walk at the principal entrance to the fortress town. You'll follow the yellow arrows of the Camino through the Old Town passing Monuments, Museum's and lots of shops until you pause to admire the views from the fortification as you look down towards the River Minho and the hilltop border town of Tui on the opposite bank. Then on leaving the fortress it's downhill to cross Eifell's international bridge. After you reach half-way across the bridge say good-bye to Portugal and hello to Spain!. After a short climb you're in the Old Town of Tui with its imposing hill-top, fortified Cathedral and well-preserved Old Town. TUI : You'll stop to admire the Gothic-style entrance to the 12th century Cathedral in Plaza de San Fernando. Pick up your audio guide and explore inside. Make sure you visit the viewpoint and tower inside the Cloisters as it will be worth all the effort! Then you'll be whisked away for a short journey through lush, green countryside passing kiwi plantations and of course lots of vines to the next place of interest, the winery, Terras Gauda in the heart of O Rosal. TERRAS GAUDA: Your going to enjoy a guided tour of Terras Gauda winery one of the largest and most reputed in the southern part of D.O. Rias Baixas. Learn a bit about how they look after their wines, the harvest and the elaboration of the wines themselves. You'll taste their range of award winning wines including 100% albariño and the distinctive O Rosal wine where a variety of grapes are utilised including albariño, loureiro and caino blanco. You'll be served each glass of wine with an aperitive so the wine hopefully won't go to your head but will help to open your appetite ! LUNCH IN A GUARDA: Then after another short journey we will stop for lunch in the fishing town of A Guarda next to the Port itself where you can smell the fresh sea air and enjoy the fantastic views of the town and the sea. You're going to love lunch ; a seafood extravaganza ! It's at a family run restaurant in a cozy, modern designed restaurant with lovely terrace. First there's the shellfish starters like mussels and razor clams then the amazing main dish of the day lobster and seafood with rice, one of the delicacies of this part of the Galician coast. Then if there's any room left there's a typically traditional, home made desert. This is all washed down with the local albariño wine to ensure you'll have an unforgettable meal. SANTA TECLA HILL: Before we leave A Guarda we take the the steep,curved hair raising ascent to the top of the hill where there is a one of the most visited sights in all of Galicia. The extensive and well conserved remains of a pre-historic, fortified Celtic hill settlement (Santa Tecla Hill ) perched high up above the town in the wooded Monte Santa Tecla which was only discovered in 1913! The celta, as its known, probably originates from about 500 years BC and there are remnants of over a 100 huts inside an encircling wall. Some have been fully restored with thatched roofs. There is also a stone circle, a church and Celtic museum. The views from the top in every direction either looking out to the wildness of the Atlantic Ocean or inland towards Portugal and the River Miño valley are fantastic and admiring the sunsets from here is one of the wonders of Galicia! AREA GRANDE BEACH : Then its back down to our next stop and time to follow the Camino again, this time along the dramatic coastline just outside the town on the road to Baiona. We start by following a walkway from the car park next to Area Grande beach hugging the coast along a narrow footpath over a rocky landscape with the noise of the crashing waves of the Atlantic Ocean. We go as far as an old fish farm built out of the sea which used to operate to catch shellfish and seafood like the local lobster. Our driver again will be waiting to pick us up to continue our route following the Coastal Way. BAIONA : Either just before Baiona we will be dropped off again so we can continue to follow the Camino as far as Baiona or we will stop in Baiona itself and walk around the fortress. Either walk is spectacular. There'll be some time to explore Baiona which is one of the top resorts in Galicia. Nestled in a protected bay facing the Atlantic Ocean it has a thriving port/harbour full of fishing boats and luxury yachts. It´s location in the southern Rias Baixas makes it an ideal holiday destination and family resort renowned for its Blue Flag beaches. Baiona became famous thanks to the arrival on 1st March 1493 of the ship Carabela La Pinta captained by Martín Alonso Pinzón with news of the discovery of America and Arribada festival celebrates this every year. A Taster of the Portuguese Way and the gastronomy of Southern Galicia. This morning meet your Food, Wine & Walking Guide at your hotel in the city centre or other meeting point like the cruise ship port, train station, etc... please advise where you would like to be picked up. Transfer by highway down across the border to stop in the fortress town of Valença do Miño and we will be dropped off to start our camino walk. First walk through the streets of the town follow the yellow arrows to the look out point from the Fort of Valença to take some great photos of where we will walk across to Tui, Galicia. Then we will walk part of the Portuguese Way over the old iron bridge into Tui, Galicia, Spain (Walking Distance/Time: 2kms approx.., 40mins). We will visit the Fortified Pilgrimage Cathedral of Tui and a walk around the old quarter (NOTE: You will have audio guides in the Cathedral of Tui to visit at your own pace). After we will be transferred along the Galician side of the Miño river to the O Rosal wine country a sub-zone of the D.O. Rias Baixas. We will enjoy a guided tour of one of the top Albarino wineries in the area (Bodegas Terras Gauda) as well as a tasting of their fine wines. Then we will make our way to the Southern most point of Galicia´s Lower Rias Baixas, the small fishing town of A Guarda. On the port at a special traditional restaurant we will have seafood lunch with lobster and rice what this village is famous for. 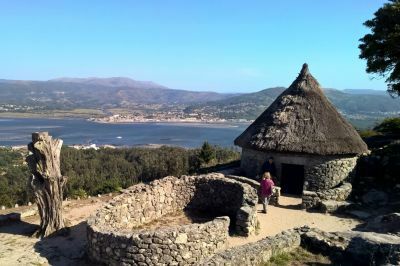 Before leaving A Guarda we will make our way to top of the Santa Tecla Hill (monte St. Tegra) with remains of a Celtic Hill fort and amazing views of the mouth of the Miño river and the coast. Now back on the Camino trail to walk the most scenic a part of the Portuguese Coastal Way route from the Playa de Area Grande to the old fishermen’s traps along a picturesque coastal trail (Walking Distance/Time: 2kms approx.., 40mins walk). The we will be pick us up and taken up the beautiful coastal road to the lighthouse of Cabo Silliero. If you are still up for more walking we can take the coastal road bike/walk path all the way into Baiona ending in the old quarter (Walking Distance/time: 5kms, about 1hr30mins approx.. walking). Alternatively could do a shorter walk in Baiona as there is a seawall around the Parador Castle of Baiona with spectacular views of the coast and the Cies Islands. Transfer by coastal road back to Vigo. Drop off where you were pick up from and final goodbye from your guide and driver.